Savvy Deets Bridal: "Keep runnin' runnin'!" Hello dear Savvy Deets Bridal readers! Oh how I've missed blogging the past few weeks!! :( I've been so MIA, its a terrible feeling. I've been overwhelmed with a lot of real life activity, and it has sorely affected my ability to post any content at all, and to just be an active blogger, tweeter, even a friend. My work life has been insane, and then I have decided to participate in "K" runs (5K, 12K, etc) leading up to a half marathon in January! 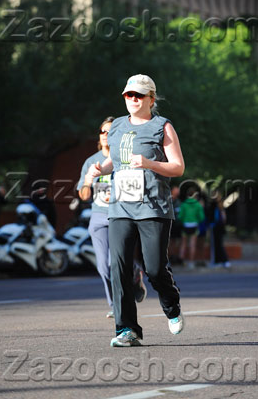 The pic above is of the Phoenix10K race I just participated in over the weekend-I ran the 5K, a first! The training is unreal, exhausting, and rewarding. Combining the long runs with my long work days, all I want to do is crash for a few hours, before a new day starts again. I have some inspirations boards coming, just in time for the holidays, and some amazing submitted real wedding shoots that I cannot wait to share with you all! I will be back in action, but for the time being I'm running around, literally! Sending the very best wishes to all!